We will carry out a comprehensive traffic restraint review, and will examine feasible methods of controlling traffic growth in the borough. We will improve the street environment for pedestrians by ensuring the provision of unobstructed, well lit, well surfaced, and well protected footways. 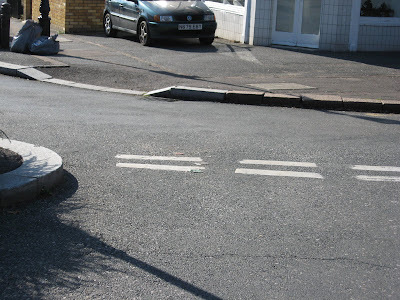 We will make the street environment more accessible to all, in particular by providing dropped kerbs, tactile paving, and other facilities to meet the special needs of people with disabilities. The street in the photograph below is Stanley Road E4. Its pavements have been completely taken over by parked cars, rendering them at best unpleasant to walk on, and at worse totally obstructed. And since the road has been in this state for over a decade I think we can safely conclude that no councillor in the London Borough of Waltham Forest, least of all Councillor Bob Belam, gives a damn. The Green Charter is a fundamentally worthless document, which bears no relationship whatsoever to Council practice. Forest Road at the junction with Fernhill Court. In the distance is the junction with Hale End Road. You can see the problem, can't you? Drivers come on to Forest Road from the North Circular or the M11 motorway, where many of them will have been belting along at 80 mph. They then abruptly enter a built up residential area with a school, housing and a 30 mph zone. And they are going down a hill. Naturally, virtually no driver stays within the speed limit. At the junction with Fernhill Court there's a solar powered speed sign. It flashes at just about every driver who passes. And naturally many drivers couldn't give a toss, as the sign is purely advisory. If there was a speed camera here they would slow down, but where there is no enforcement drivers opt out of road traffic law. 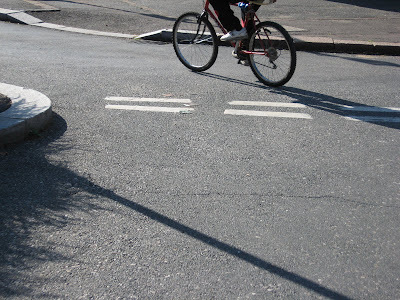 The problem for cyclists is that at this junction the road suddenly narrows and there's a traffic island. 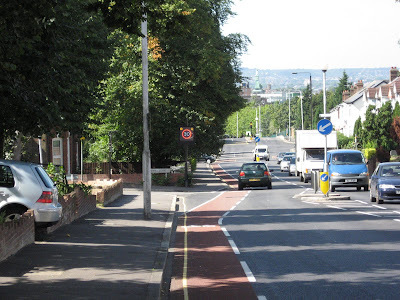 The result is that high speed drivers drift into the cycle lane, as can be seen in all these pictures. It is not pleasant cycling at this spot, when a moron in a ton of metal races past about an inch from your right handlebar. 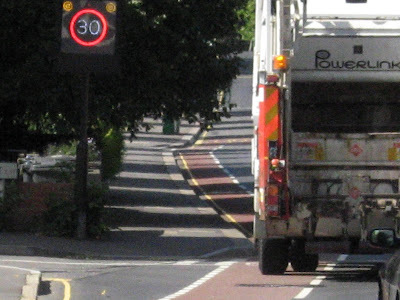 And, yes, even London Borough of Waltham Forest refuse trucks break the speed limit here (see last picture). Don't be surprised if in the future a cyclist gets killed here. But if will, of course, be "an accident". Even though deaths on Forest Road resulting from excessive speed over the past decade now exceed those in the average rail crash. Recent legislation gives the Council the power to install speed cameras at more or less any location it chooses. This spot ought to be top of the list. 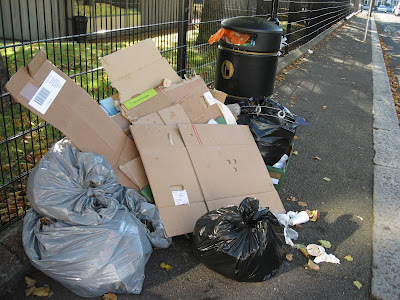 The Green Charter is, of course, complete garbage. 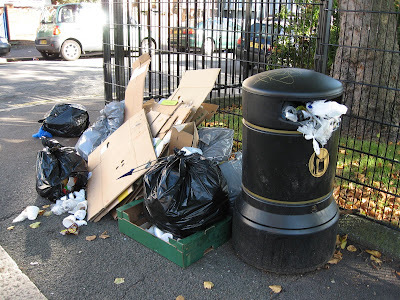 Footways are obstructed across the Borough in a variety of ways and this crap Council couldn't give a toss. 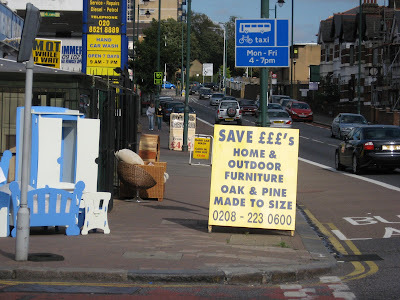 Just one of many obstructions are shopkeepers' 'A' boards, illegally placed across the public footway. 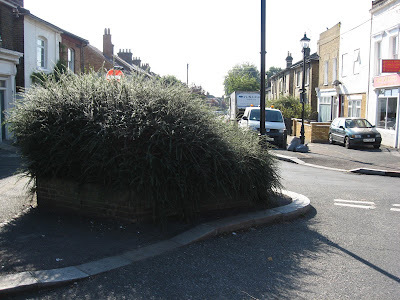 Here is just one very prominent example of this phenomenon, on Lea Bridge Road at the junction with Shernhall Street. You wouldn't want to be a blind person negotiating this collection of hazards, would you? 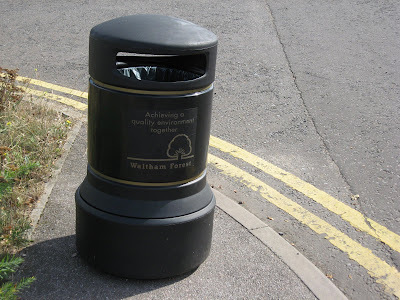 And having introduced a dropped kerb for wheelchair users we will then obstruct it with one of our 'quality environment' litter bins! Oh really? I don’t know of a single public footpath in the Borough which is signposted. Nor am I aware of any Council publication which marks public footpaths in the Borough. 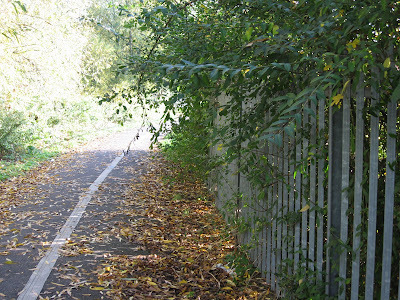 This public footpath is unmarked, by the Waterworks centre and nature reserve beside Lea Bridge Road. And it has been neglected and obstructed on a regular basis for as long as I can remember. Here’s the latest obstruction. I've never met another cyclist on it, possibly because the route is so convoluted it's a lot quicker using main roads. Or perhaps it's just that some parts are terrifyingly isolated and run-down. 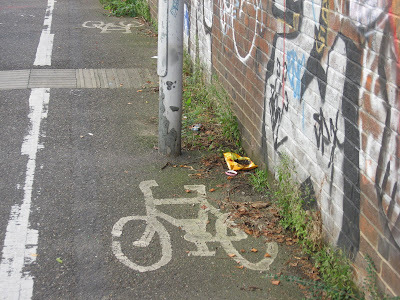 These photographs illustrate a section found on LCC's London Cycle Guide No. 5, grid 24 Dc. The entry point to the cycle lane on Beech Hall Road E4. 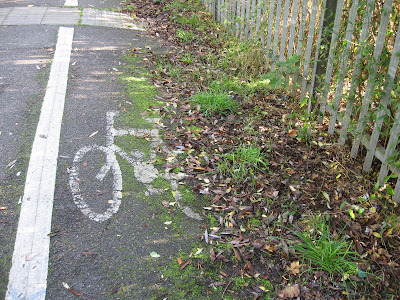 The cycle lane logo has almost completely vanished, aptly symbolising the culture of neglect which permeates the cycling environment in the London Borough of Waltham Forest. 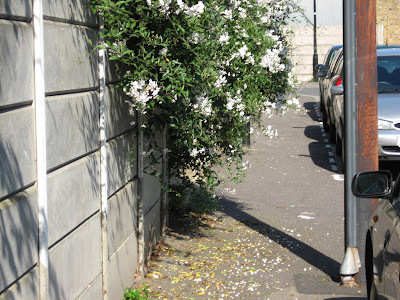 Solanum Jasminoides is a lovely plant - but not on a narrow pavement where the Council allows pavement parking. 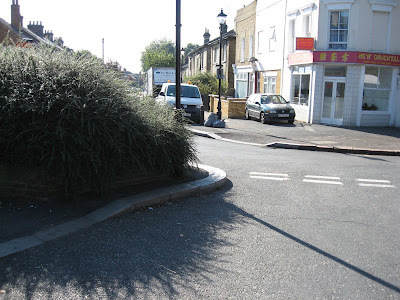 It's unlawful to block the footway with overgrown vegetation but LBWF couldn't care less. Actually our caring Council provides 'passing places' for pedestrians on narrow pavements where it allows pavement parking. Needless to say these 'passing places' (for footway users with a mobility handicap) are often either obstructed or, with boundless cynicism, located at places where there is obstructive street furniture. Just another example of the way in which this crap Council, having turned pavements over to car parking, abandons pedestrians to their fate. 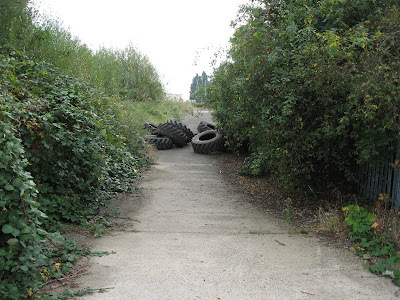 These pics were taken on Ravenswood Road E17, if you want to go along and take a cutting. A couple of months ago I posted a photo on this blog showing obstruction of a cycle stand (on 17 August), on Vernon Road. As you can see the situation is now even worse than when I first drew attention to it. This photo was taken this afternoon. 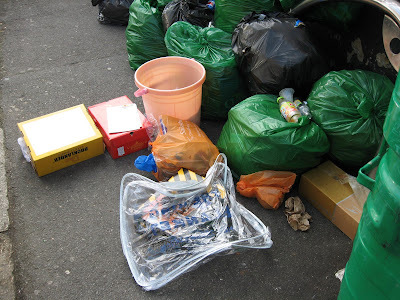 And the obstructive rubbish, most of it, appears to be trade waste. I think I can guess which premises it comes from. 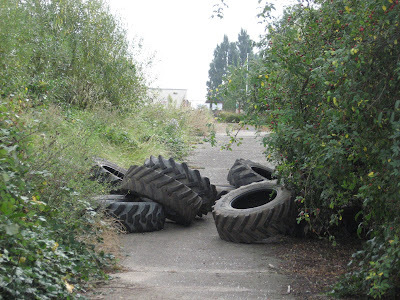 But the London Borough of Waltham Forest shows no inclination to crack down on the business responsible. Below: can you find the cycle stand? Turning left here is banned. Turn left and you'll find yourself going the wrong way down a one-way street. But would any road user know it? Am I really the only person who has noticed this? The Council has a wonderful new cost-cutting wheeze, namely cutting down on expenditure when it comes to signing NO ENTRY streets. Wherever it thinks it can get away with it, it doesn't bother to paint NO ENTRY on the carriageway. Sometimes it doesn't even paint any kind of white line. And it reduces the conventional pair of signs on posts, one on either side of the carriageway, to just one side - the left side, irrespective of the circumstances of the site. The consequence of this cheapskate approach to signing is that drivers turn into 'No Entry' one way streets and drive down them without realising their mistake. And since there are circumstances where the driver literally can't see the solitary NO ENTRY sign (because it is obscured by vegetation or a parked vehicle and because there are no markings on the carriageway) the scene is set for, at worst, a head-on collision. In the photo above you can just glimpse the only NO ENTRY sign on a pole, ridiculously situated a long way from the junction. It's visible to drivers in high vehicles but not to those in sports cars or smaller vehicles. The location shown is Beulah Road E17, at the junction with Grosvenor Rise East. Some drivers make a banned left turn here and go down Maynard Road. Others continue all the way along to Grove Road. I've three times recently been cycling from the other direction and met drivers coming the wrong way. Most recently I met a van driver head-on, just beyond the bush. I pointed out to him he was heading the wrong way down a one-way street and he was genuinely surprised and apologetic. Ironically, as I sat on my saddle and took these snaps a cyclist came by and made the banned left-turn. Perhaps he didn't see the sign either. I shan't be surprised if there's a serious head-on crash here one day. And the London Borough of Waltham Forest will bear a heavy responsibility. Wilson Street E17, at the junction with Addison Road. Outside Henry Maynard school. 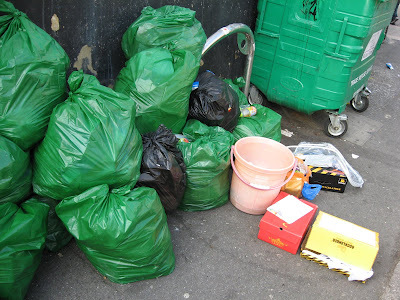 The waste from one split sack almost reaches the kerb, so don't try getting past with a wheelchair, pram or buggy. Selborne Road E17, by the entrance to the underground car park, 10 a.m. today. 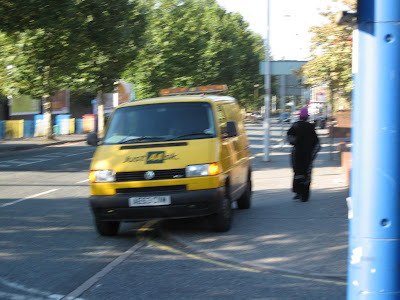 I’ve noticed that the driver of an AA van regularly parks here, partly obstructing the bus lane and partly on the pavement. The driver is clearly not doing so to attend to a breakdown and even if there was a broken down vehicle there would be no excuse, as there is plenty of off-road park parking just metres away at the approach to the Town Square. I’m not sure why the driver does this as the vehicle was unattended when I took this photo. Popping into the shops? Delivering something to the car wash opposite? I suppose this inconsiderate parking shouldn’t be a surprise as the A.A. has always been committed to promoting bad driving and was originally formed to help motorists avoid police speed traps. Why isn’t the nearby CCTV focusing on this illegally parked vehicle? Any other motorist who did this would get a ticket. Why is the A.A. not instructing its drivers to obey motoring law? 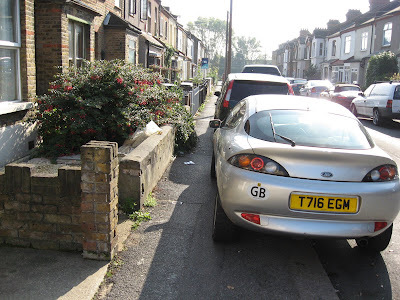 Why is the London Borough of Waltham Forest apparently unaware of this recurring example of lawless parking? You can see what happened, can't you? 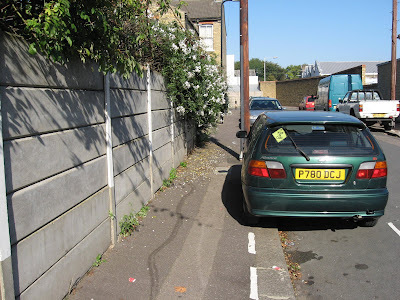 Some bright spark in the highways department in those municipal offices on The Ridgeway thought it would be a marvellous idea to introduce pavement parking on to Wyatts Lane, off Wood Street E17. Historically, there had never been pavement parking here. 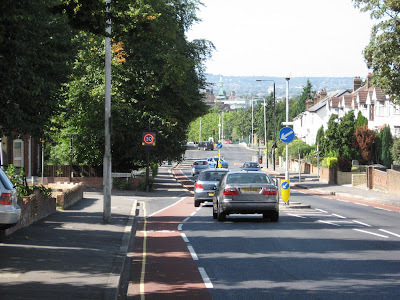 But the London Borough of Waltham Forest is passionately committed to extending car ownership and use and, in particular, to accomodating those residents who choose to buy large vehicles. A good way of accomplishing such goals is to turn pavements over to cars. In this case our bright spark looked at a map and brought in a traffic order. What the map didn't show, of course, is trees. The recommended national minimum footway width for pedestrians is 2 metres. Car-crazed Waltham Forest shaves this to 1.4 metres, occasionally even 1.2 metres. 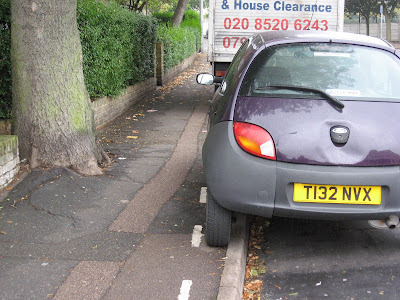 But the space left between parked vehicles and this tree is one metre - well below anyone's standard, including that of the London Brough of Waltham Forest. But who cares, after all it's only pedestrians we are talking about. 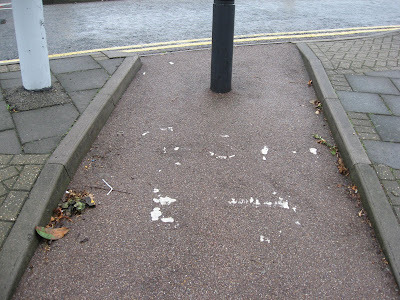 And once the Council has achieved its goal of turning pavements over to motorists no one gives a toss about the conditions which then exist for wheelchair users and others with a mobility handicap.